Textile designer John Robshaw is wandering around his midtown Manhattan showroom wearing a deep suntan, Paul Smith sneakers and his bed-sheets. (He’s sporting a fresh pink-and-white button-down that he fashioned from leftover bed-linens.) Mr. Robshaw, with floppy, sandy blond hair, looks much like a fair-haired Notting Hill-era Hugh Grant. Stepping into the showroom — floors adorned with turquoise-and-cream printed dhurries and lavender poufs, shelves heaped with silk-ikat cushions, block-printed linen bolsters, and cotton voile quilts and shams patterned in life-validating colours — I feel as though I’ve tumbled into a country estate in Jaipur. 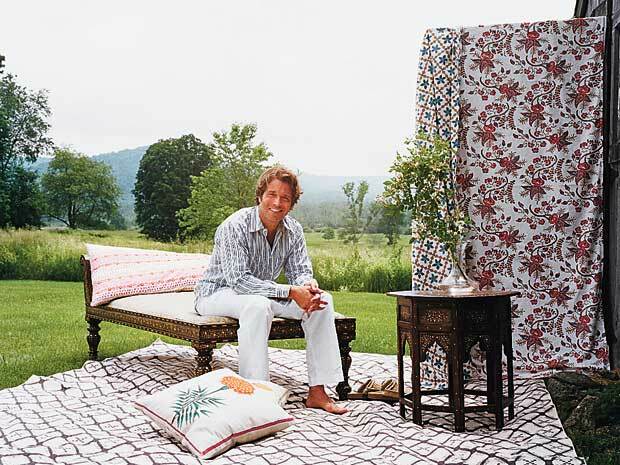 In their jubilant palettes, feel-good exotica and sheer abundance, Mr. Robshaw’s textiles imagine life more vivid, a romantic, Merchant Ivory-approved India — the sort that makes you want to spend your days in linen tunics, dabbling in elephant polo and sipping Darjeeling tea in marigold gardens. After earning a fine-arts degree from New York’s Pratt Institute, and studying etching and printmaking in Italy, Mr. Robshaw discovered an obscure grant to study Chinese block-printing. “My parents were like, ‘You’re studying what?’ ” Mr. Robshaw says, laughing. So, he set off to China’s Academy of Art on the banks of West Lake in Hangzhou. “I did that whole art thing in my 20s,” he says. That art thing also found him in Ahmedabad, the largest city in Gujarat, studying at the National Institute of Design. And in Jaipur, Rajasthan — known as the arts-and-crafts capital of India — Mr. Robshaw worked alongside local block-printers, bangle-makers, potters, Pishwai painters and marble-carvers. “It was crazy — everybody is making stuff right in front of you. People are zooming by. There’s an intensity of colour and humanity. And then some weird colonial guy in a bow-tie will start talking to you in 120 degree heat,” he recalls. In this delirium of colour, Mr. Robshaw fell in love with the intimacy and immediacy of Indian fabric-making traditions, which taught him about dying, printing, stitching and weaving textiles. Mr. Robshaw (he is no longer selling his prints to designers, focusing rather on his own collections) still travels to India twice a year for inspiration, divining 40 to 50 new prints per season. “I’ll use traditional shapes and forms, but redraw or patch them, modernize them, organize or disorganize them,” he says, “so that what you get is not as predictable. It’s more layered and complicated.” To design the artwork for each block-print (all wood blocks are hand-carved in Jaipur), he might, for instance, find inspiration in ancient tile courtyards, architectural fretwork, the look of indigo-dipped paper or the routes of barn swallows. The idea for Mr. Robshaw’s flame-red “jaggery” quilt print was sparked by India’s Diwali Festival (which finds the country a-kindle in firecrackers). Meanwhile, when Mr. Robshaw beheld an assortment of unravelled turbans at a dust-veiled antique market in Hindustan, he came up with the idea for this fall’s new line of “Indigo Turban” quilts and shams; each quilt is hand-tied by a turban maker in Jodphur. “No one is the same,” he says, “like a drawing.” His decorative hand-painted Pishwai pillows, washed in gentle, childlike watercolours, took their inspiration from temple paintings of gods frolicking in gardens. Restraining myself from the desire to doze, I opt instead to walk around this happy-making Mr. Robshaw-divined bazaar of colour, pattern and print — both kinetic and consoling. “In India, with all that colour and action, you can get easily burned out,” he says, “but you can’t get depressed. And I’d always rather be burned out than depressed.” Indeed, in a Mr. Robshaw room, better-than-therapy anodyne to winter blahs, depression will seem as improbable a proposition as playing elephant polo in India — or donning your bed sheets to work in midtown.